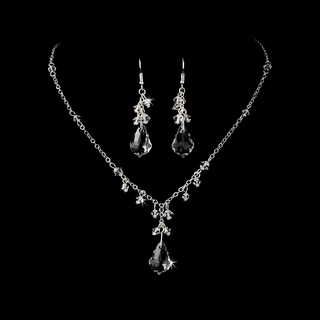 The glamorous sterling silver plated necklace in our "Simply Stunning" set features clear Swarovski crystal beads that lead up to a gorgeous, uniquely-cut, pear-shaped crystal drop that produces radiant beauty! The earrings echo the graceful style of the necklace with the same fabulous gemstones that hang and glitter romantically in the light. This set would be perfect for your wedding, prom, homecoming, or special occasion! Size: This necklace measures 15-1/2" long 2" adjustable extender; the central drop measures 1" long. The matching earrings measure 2" long.